Sing the Light, Sing the Warmth, and Receive the Gift comprise the trilogy of The Singers of Nevya, completed in 1997. A follow-up novel, Singer in the Snow, was published in 2004. These novels, unlike my other works, are science fantasy, which is to say they are soft science fiction with one fantastic element, in this case, the psi, or telepathic powers of the Singers who create warmth and light for their people. Nevya is an ice world, a planet under a binary star system (see, a little science sneaks in), where summer comes only once every five years, and the ground is frozen so that metal is impossible to obtain. To create a world where technology would not exist was my challenge with Nevya. If the people were not dependent upon the psi-Gift Singers for their survival, there would be no story. In this world, the psi is both telepathic and telekinetic, which means that the Singers can hear each other’s thoughts, but their main function is to use telekinesis, focused through music, to speed the molecules of air and water to create warmth. It was my conceit, in the early conception of the system, that they would also be able to create light with their abilities; after Sing the Light was already in print, I learned of an obscure bit of research in which scientists projected sounds beneath water, and created bubbles of light they dubbed sonoluminescence! I could have saved them the trouble . . .
Now available as an e-book for the Kindle! A rich story of cultural revolution. The singers of the ice planet Nevya use their musical psi-powers to hold back the deadly cold. In Sing the Light, young singer Sira loses faith in doctrine after a violent encounter with power-hungry politicians. She sets out on her own in Sing the Warmth, spending years gathering and training like-minded individuals. Her attempt at peaceful cultural change is nearly ended when the mad carver Cho attempts to take over Nevya in Receive the Gift. This tale of duty, loss, self-sacrifice and standing up for one's beliefs is occasionally gritty, often suspenseful and always emotionally gripping. Sing the Light Marley is herself a writer of considerable talent. She's a good prose stylist and her characters are quite engaging. She obviously knows something about music and does an excellent job of showing how the musical talents of the Gifted combine with their psychic powers. Many readers, particularly those who love Pern and Darkover, will appreciate visiting Nevya. Sing the Light Louise Marley is a natural fantasy writer . . . Marley's world tinkles with music, light, and creativity . . . to produce a Midsummer Night's Dream feel. Her writing is ethereal and touching, and her plot is irresistible. Sing the Light Sing the Light is a science fiction/fantasy crossover style novel. On this colony of humanity, the cold, bleak, harsh planet with an unusually long year has produced a human psychic mutation . . . a guaranteed good read, pure entertainment. You'll never be able to tell it's good for you by the way it tastes. Sing the Light First novelist Marley shows a real feel for the elements that make fantasy (and science fantasy) popular. Sing the Light Sing the Light is a highly crafted science fiction tale that makes authentic use of the author's extensive musical background. Sing the Light Marley makes her writing sing. Sing the Warmth With this sequel to Sing the Light, Marley again demonstrates the storytelling skills that carried her first novel . . . Marley's lively storytelling and engaging characters give them a life of their own. 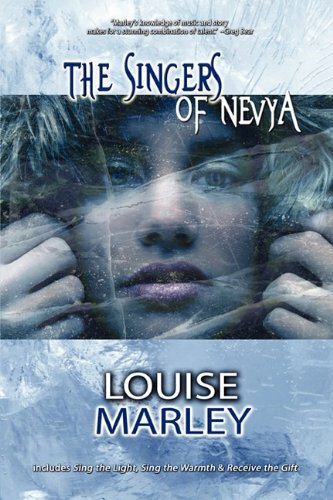 Sing the Warmth While shivering under the weight of our own wintry beast, pick up Louise Marley's books and warm yourself at the fire of Sira's extraordinary heart. You'll be glad you did. Receive the Gift Receive the Gift . . . concludes her trilogy about descendants from a crashed starship who survive on a very cold planet (summer comes once every five years) by their ability to create psionic warmth through singing. I've enjoyed all three. Receive the Gift The subject . . . is full of beautiful ideas and the feeling for place is real, specific, substantial.